We’d love your help. 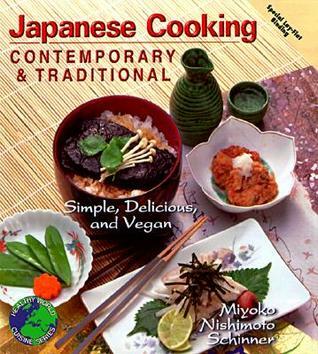 Let us know what’s wrong with this preview of Japanese Cooking - Contemporary & Traditional by Miyoko Nishimoto Schinner. To ask other readers questions about Japanese Cooking - Contemporary & Traditional, please sign up. This was a spur of the moment purchase, and I didn't really know what to expect, but now that I have it and tried a few recipes let me say that I am absolutely in love with this one. I wanted to try and cook something new - usually, my cooking is mostly influenced by various European/Western cuisines and Indian cooking. I admit that I was very clueless about Japanese cooking, so I was grateful for the introduction and glossary (and I owe a huge debt of gratitude to the nice owner of the Asian st This was a spur of the moment purchase, and I didn't really know what to expect, but now that I have it and tried a few recipes let me say that I am absolutely in love with this one. I adore Japanese food. Alas, it's nearly impossible to eat vegetarian, let alone vegan in Japanese restaurants because they have to spice everything up with fish flakes. This book is amazing- though not always traditional Japanese, all recipes are simple and turn out lovely. Still, there are many authentic dishes and the information about vegetarianism in Japan and ingredient guide alone are worth the whole book's price. While I learned a few things from this book, and I would totally love to eat these dishes if someone else prepared them, Japanese cooking doesn't quite appeal to me, or at least my cooking philosophy: unfussy, quick to prepare, nutritious (balance of protein, veggies, good carbs, etc), and the least number of separate steps and/or pots and pans, the better. I read this on an overseas flight and, my goodness, it made me hungry! I have since tried some of the recipes with nice results. The book is not only inspiring but easy to follow. The glossary of terms was very helpful too. Before I got this book, the only Japanese food I had ever tried was sushi (I knew about Miso soup but was sceptical) .... I am a vegan and before that, I didn't like fish, so let's say that Japanese food in restaurants etc. was never really for me. It turns out that veganized Japanese food is absolutely delicious. It should go without saying that to make most of the dishes, you should live in an area where supermarkets stock Japanese staples (such as Mirin and Sake) or which has Japanese shops (ar Before I got this book, the only Japanese food I had ever tried was sushi (I knew about Miso soup but was sceptical) .... I am a vegan and before that, I didn't like fish, so let's say that Japanese food in restaurants etc. was never really for me. It should go without saying that to make most of the dishes, you should live in an area where supermarkets stock Japanese staples (such as Mirin and Sake) or which has Japanese shops (around where I live, Korean shops often have the same ingredients but cheaper). The book doesn't have much illustrations, but it is organized very well and it has a lay-flat binding, which is my main criterion for cookbooks. Japanese Pilaf (Maze Gohan). I could eat this every day. I loved how clearly the author covered the history and social context of the foods she discussed, it added a whole extra layer that many recipe books lack. The book was well organised, and the straightforward glossary at the beginning was really helpful. I've tried a few recipes so far (and enjoyed all of them), and I plan to try more. I'd be giving five stars if there were more pictures, and perhaps if the book was longer. There were a few minor printing errors in my edition, which just led to o I loved how clearly the author covered the history and social context of the foods she discussed, it added a whole extra layer that many recipe books lack. The book was well organised, and the straightforward glossary at the beginning was really helpful. I've tried a few recipes so far (and enjoyed all of them), and I plan to try more. I'd be giving five stars if there were more pictures, and perhaps if the book was longer. There were a few minor printing errors in my edition, which just led to occasional blank pages, but didn't impact readability. 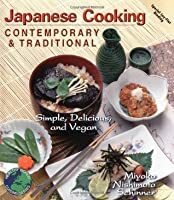 I bought this book while I was living in Japan to learn how to make authentic Japanese dishes without animal products and it continues to help me immensely toward that end. I have been satisfied with every recipe I have tried from this book. However, the fact seems to remain that, in order for certain dishes to taste truly authentic, they just have to have fish flakes in them. a really nice book with a fokus on fresh veggies served in a delightful and nice looking way. As always with japanese food its good for the eyes looking aswell as the tastebuds. For anyone that liked Mari Fujii's "The Enlightened Kitchen" This one is a nice addition, or replacement if you havent managed to get your hands on the former. Excellent. Needs more fresh recipes. I don't mind the reliance on tofu. Authentic book. Japanese family impressed.